Yamamoto Baiitsu, an early nineteenth-century literatus, has been acclaimed as one of Japan’s consummate painters of bird-and-flower compositions. In this monumental scroll, he pays homage to the Chinese scholar-amateur tradition in his use of the plum motif, a symbol of moral fortitude. 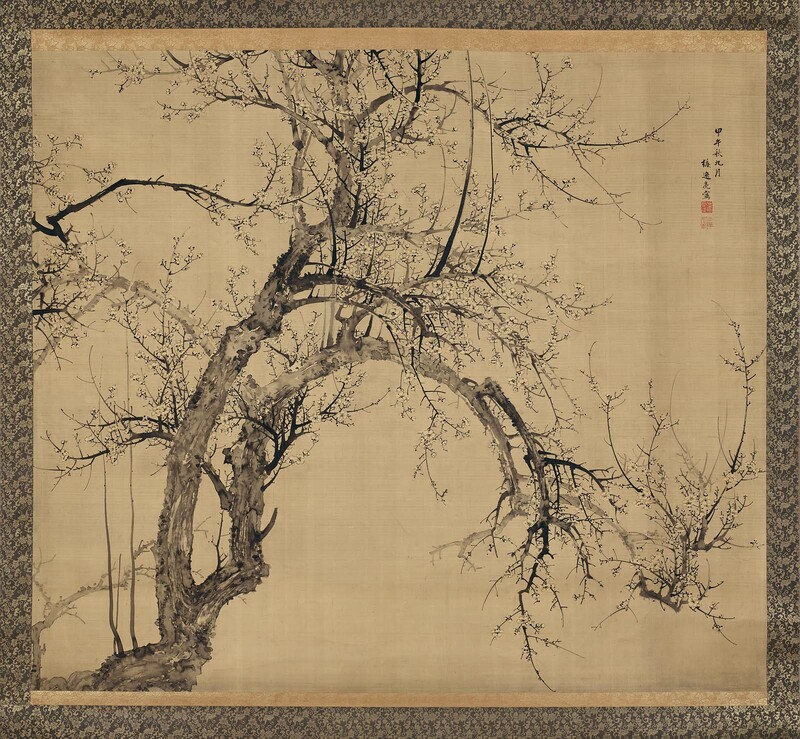 The arrangement of the magnificently twisted branches refers specifically to the work of the fourteenth-century master Wang Mian. Baiitsu’s lush use of ink, however, with its sensuous play of dark and light in the luminous blossoms of early spring, is distinctively Japanese. Throughout his career Baiitsu held a particular admiration for scrolls of blossoming plum trees by the Yuan-dynasty master Wang Mian (d. 1359). So much so that it is said that his artist name Baiitsu, which literally means “Plum Leisure,” was conferred on him after he viewed one of Wang Mian’s work in a Nagoya temple. In this monumental scroll Baiitsu pays homage to the Chinese literati tradition in his adoption of the plum motif, a symbol of moral fortitude, and specifically to Wang Mian in embracing the Chinese artist’s arrangement of the magnificent twisted branches, as seen in a celebrated scroll in the collection of the Imperial Household Agency. However, Baiitsu’s lush use of ink, which pools in areas along the gnarled trunk and creates sensuous plays of dark and light evident in the luminous blossoms of early spring, is distinctively Japanese. Baiitsu’s signature in the upper right corner dates the painting to 1834, two years after the artist moved from Nagoya to Kyoto, seeking company with a wider community of scholars. Although Baiitsu occasionally returned to his home town for exhibitions, the square, relief seal which gives the studio name “Gyokuzen” indicates this impressive scroll was executed in Kyoto.